December – 2016 – dBase, LLC. The New dBASE™ PLUS 11 includes new features and functionality to make developing great data-driven programs and web applications easier than ever before! BINGHAMTON, N.Y. – Dec. 14, 2016 – PRLog — dBase, LLC today announced dBASE™ PLUS 11, the latest version of the legendary dBASE™ database management system. Recognized as the world’s first widely used desktop data management system, dBASE™ remains one of the most popular software titles in the world. The new dBASE™ PLUS 11 version offers users a variety of new features to increase user productivity and delivery of applications to their customers. NEW: Touch and Tablet support – dBASE™ PLUS 11 now supports touch and gesturing with enhanced support for tablets! NEW: Assist™ Technologies – allows users to be more productive in a shorter amount of time by making it easier to use dBASE™ PLUS 11! NEW: dmAssist™ – the data module designer introduces a much easier interface for building and working with data modules. The new dmAssist works with both data-layers of the BDE and ADO technologies! NEW: dmWeB™ – the #1 requested feature from our users, the new dBASE™ PLUS 11 makes building data-aware web applications easier than ever before with a new responsive web framework that works on both Apache® and Microsoft® IIS technologies. NEW: dmOutput™ – the #2 requested feature from our users, the new dBASE™ PLUS 11 makes generating output from data modules a snap! NEW: dmC.R.U.D.™ – the #3 requested feature from our users, the new dBASE™ PLUS 11 makes generating a starter application as easy as pointing to an existing data module and generating the base application! NEW: Programmer Fonts – dBASE™ PLUS 11 now ships 7 new open source fonts that are designed to make code easier to read and print. These new fonts can be shipped with applications created by dBASE™ PLUS 11! UPDATED: databuttons – the standard data-aware components have been enhanced to support components with graphics 24×24 through 64×64. 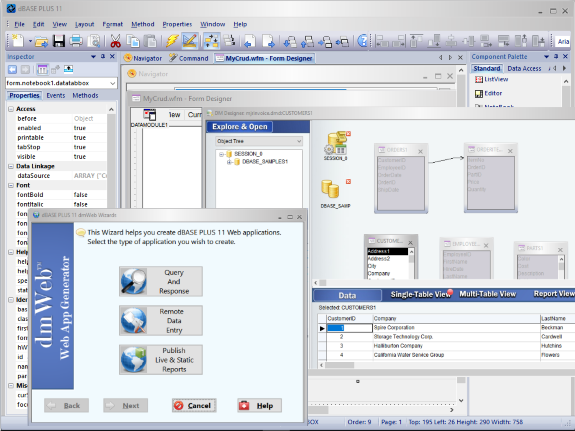 UPDATED: Windows Theming – dBASE™ PLUS 11 now supports 10 advanced Microsoft® Windows themes. The new dBASE™ interface now uses a brushed metal but there are 9 others to choose from. Quality! dBASE™ PLUS 11 is built on the quality of the prior release, which means the quality is even better than before and we have fixed many issues since that last release! The price for dBASE PLUS 11 is $499 for new users and $399 to upgrade from existing dBASE products. The new version of dBASE™ continues to support forward compatibility features, including dBASE™, Paradox®, and other data sources; the advanced runtime features; and the ability to package the product with the updated Project Manager. dBASE™ PLUS 11 is available today on Windows Vista and above operating systems including the latest Windows 10.